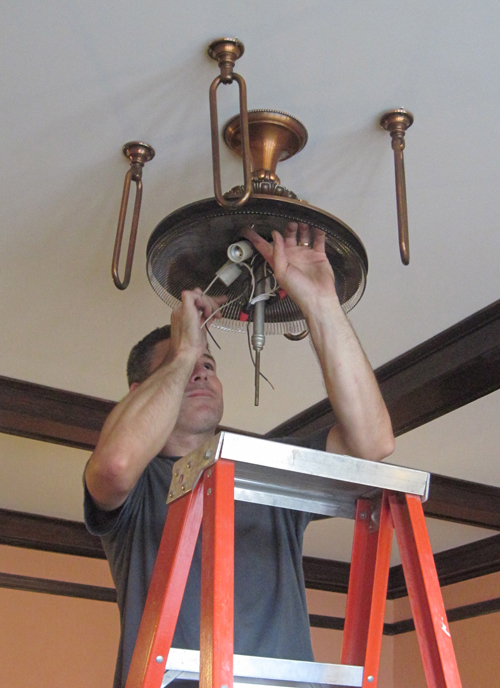 Re-installing the central dining room fixture-- the only time you'll actually see the fluted glass interior. Installed, showing two of the four peripheral globes. One of the great things about summer is that I can pursue a wider variety of projects than the school year allows. Five years ago I removed the central light fixture from our dining room while redoing the ceiling. This summer I finally got around to rewiring the fixture and replacing the sockets, as the insulation had degraded a bit since 1905. The fixture is an incredible piece of craftsmanship, composed of eleven different pieces of bronze and two pieces of glass. I had to make a template to locate the four corner loops, which actually only bears weight when the brass socket assembly is removed. 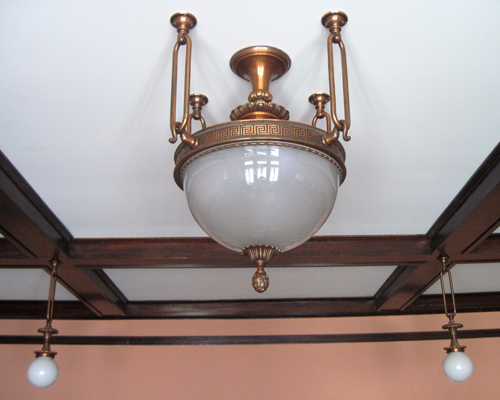 This is the finest fixture in the house, and I trust that it will now be in good service for another hundred years. The workmanship on that metal reminded me of a painting that I made for a friend last year, the image of which I am just now posting. It is a “portrait” of his gorgeous old Model 1860 Henry Rifle (.44 caliber rim fire, this one manufactured in 1862). 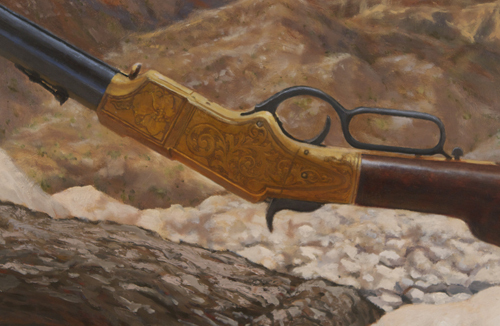 It features a receiver engraved with “running deer pattern number one” by Samuel Hoggson, a factory engraver for Henry Repeating Rifles. But of course I was just as attracted to the figured walnut stock. 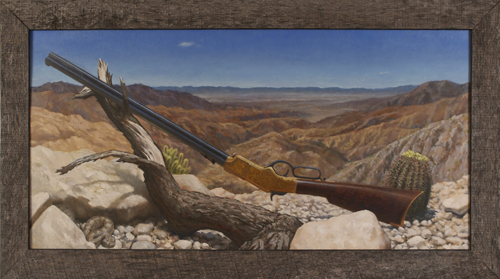 The painting was an interesting challenge, as I wanted to have the rifle convincingly immersed in a landscape that I fabricated from a few photographs and my own memory of life in the Southwest. I was able to paint the rifle from observation, but used an Italian replica for most of the work because it made me nervous having the original laying around in the studio. I enjoy having plenty of room for imagination, innovation, and problem-solving in paintings. I made the rustic frame by request, and was happy with the way that the silvery, weathered surface of the white oak offset the image. Which brings us back to wood. This summer I was able to retrieve this old church pew, which after some repair and refinishing has become the favored place to drop whatever you are carrying when you come in our front door. Although I haven’t yet been able to confirm it, I believe that the pew is made of American Chestnut. It is always a pleasure to breathe a bit more life into beautiful and useful things, but that would be even more significant “win” to me if this were in fact a remnant of the pre-blight riches that once dominated our eastern forests. I used my home-made black walnut stain to color the piece, sealed it with a thin coat of shellac, and then applied three coats of wipe-on polyurethane. 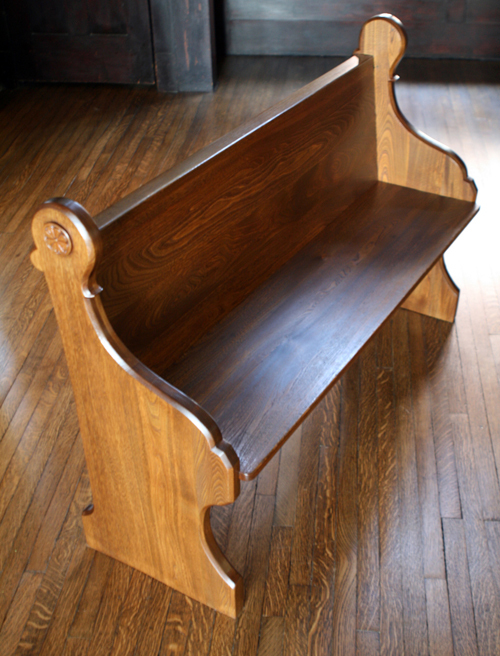 An old pew, repaired and refinished. This entry was posted in custom furniture, painting, space and surface works, Uncategorized and tagged .44 caliber rim fire, American Chestnut, black walnut stain, bronze, engraving, figured walnut, fluted glass, hand wiped polyurethane, Henry Repeating Rifles, Henry Rifle, light fixture, light installation, Model 1860, pew, refinished pew, running deer pattern number one, rustic frame, shellac, wipe-on polyurethane on August 23, 2011 by johnsarra.